like Marbles, but better | Que Sera Sara? Night falls quickly in the mountains. There is a brief lull between after dinner tea and the blinding darkness. A darkness that comes so thick and fast it makes brushing teeth in the far-away, bug-ridden, and pitch-black outhouse seem highly optional. But in this in-between moment where the day ends and night hasn’t yet started there is a special magic. Of creamy sunsets and campfires and prairie songs. And in this evening quiet, one night I learned to play chuko. Chuko are the ankle joints of sheep (or sometimes goats). In the ever resourceful and uncommonly poor rural regions of central Asian countries, they are used as game pieces. That probably sounds incredibly foreign. Ooh children playing with grisly bone bits! How quaint! But you’d be surprised how familiar the games are. Games similar to jacks or hop scotch or marbles. I wouldn’t be surprised if there were chuko dominoes or chuko backgammon somewhere too. We played a game which was completely new to me and yet utterly familiar. It was made up of rules and strategies just like a million games from my own childhood. They are incredibly versatile little things, solid little knobs, sort of like rounded cubes and about the size of a small walnut shell or ping pong ball. But the important thing is that each side is different. There are four main faces and two rounded ends. Each of the four faces has a name (which I couldn’t pronounce in a million years) and whichever side is facing up when you toss the chuko is crucial in the game I learned. They may all look similar at first, but trust me, after a round or two you can distinguish them easily. First, toss a table full of chuko (sort of like a giant Yahtzee roll). A special lead piece will be in the pile, and whichever of its unique sides lands facing up kicks off the game (sort of like pulling a trump card). 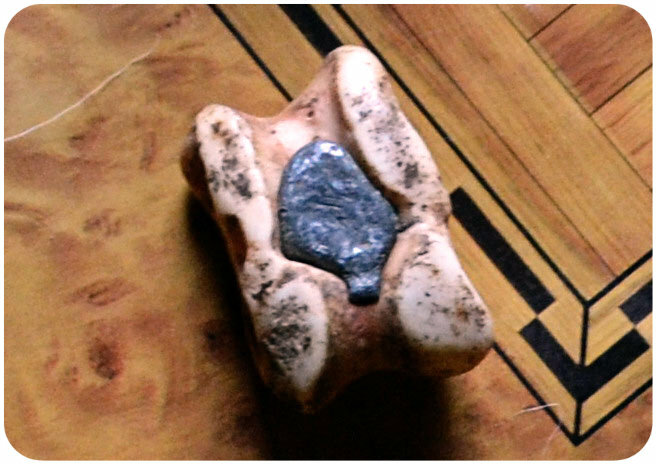 Then, you needed to find another chuko on the table with the same side facing up as this lead one. Pop Quiz! Can you tell which one of the chuko above match this lead piece? Flick your chosen (appropriately facing) piece to touch the lead piece without hitting any of the other chuko on the board (like a combination of marbles with permutations of billiards). If you succeed, you get to take the lead piece (like jumping at checkers) and play again. If you fail, it’s someone else’s turn to try. After you succeed in capturing the lead piece, then you have the free reign to match pairs in a similar fashion anywhere on the board (sort of like tabletop Go Fish) – but you always have to flick like against like; the flicker and the target must have the same side facing up. If you hit your target without touching others, you get to keep it in your booty and flick again. If you miss or hit other pieces, the game moves to the next player. Before their turn starts, you must put the lead piece back in circulation but you can keep any sets of three other pieces you have won during your turn (so for example, if you have won three or even six in your turn you can keep them; if you have won four you can keep a trio but you must put back the leftover piece; but if you have won only two pieces you have to put them both back). Once your required pieces are back in the pile, the next player re-“rolls” the pieces for a fresh board and starts again with the lead-piece. Eventually, all the pieces are picked up and whoever has the most wins (sort of like War). Unless if (in a bout Egyptian Rat Screw), if the lead piece lands with a certain squiggly side up in the initial Yahtzee toss – then whoever grabs it first wins, no contest. But be warned. This last rule leads to fits of frenzied, raucous giggles from children no matter what language they speak. Guaranteed. It’s like the cutest thing ever. I played with some Dutch kids one night and you’d think I’d given them goofballs and slurpees for their tea and milk was going to come out of their noses. It was brilliant.